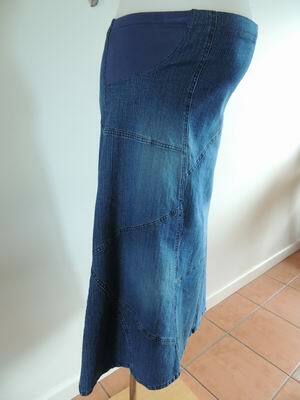 A very boho chic medium vintage wash denim patchwork style skirt. The skirt is new with tags. It is in a pull on style with soft stretch cotton knot panels let in at the sides allowing the skirt to grow with you. There is also an adjustable waistband with hidden elastic tabs. Be the first to review “NEW Patchwork Denim Maternity Skirt in Vintage Wash” Click here to cancel reply.